An animal bite is a wound caused by the teeth of an animal. The teeth puncture, tear, scratch, bruise, or crush the person’s tissue. 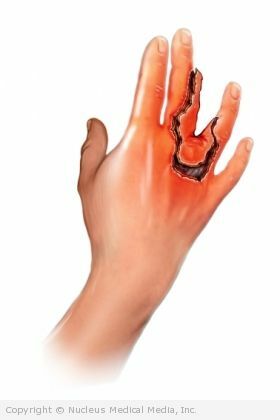 The injury can damage skin, nerves, bone, muscle, blood vessels, or joints. 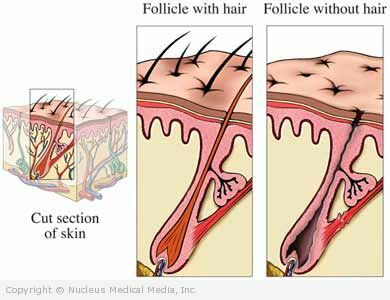 Alopecia refers to hair loss in areas of skin that normally have hair. There are two forms of alopecia: scarring and non-scarring. Acne occurs when the pores of the skin become clogged, inflamed, and sometimes infected. These clogged pores can result in blackheads, whiteheads, or pimples. Acne tends to occur in teenagers, but can also occur in adults. Acne starts in the skin’s sebaceous glands. These glands secrete an oily substance called sebum. The sebum normally travels through a tiny hair follicle from the gland to the skin’s surface. Sometimes the sebum becomes trapped, mixing with dead skin cells and bacteria. This causes clogged pores called comedones. Localized scleroderma (also known as morphea) — usually affects only the skin in isolated parts of the body. This form is less serious.